For Murray Walker fans (aka Muddly Talker) there is some fun news. 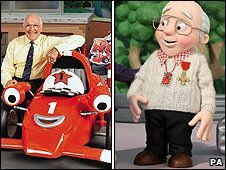 The children’s animation – Roary the Racing Car which is narrated by the great Stirling moss is to get a special voice for a couple of episodes. The animation based on some racing cars at Silver hatch circuit already has the humorous contributions from Peter Kay as big Chris the mechanic. More info at the BBC News here.